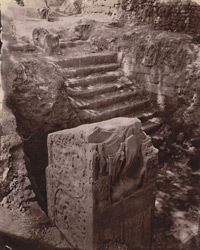 Photograph of a carved square pillar from ruins of Gupta temple, Bilsar, Itah District, taken by Joseph David Beglar in 1871-72. Bilsar was once home to devotees of both Buddhist and Hindu faiths. The remains of two monasteries attest to the presence of the former whilst five temples, one of which is shown in this photograph, indicate the popularity of the latter. The site is described in the North-Western Provinces List of 1891, "Bilsar... stands on a high mound, and has a second large mound to the south. Its former consequence is proved by the fact that the town was the residence of a Rathor Raja so late as three or four hundred years back. The Raja built a strong fort on the top of the high mound in the middle of the village of which the remains still exist... General Cunningham found the remains of carved or moulded bricks of very large dimensions, fragments of a pierced lattice in carved terra-cotta, and two round pillars, dated Gupta-Samvat 96, as well as two square pillars belonging to a temple of the Gupta period."